SUMMARY: Content marketing can drive results, but it's not always easy to connect the dots. You might feel like your blog is starting to pay off, but how can you be sure? More importantly, how can you prove it to managers and directors? In this article, two content marketing experts explain how to measure and improve results. You'll get tactics for companies large and small and a MarketingSherpa research chart. People research before they buy. The average shopper used 10.4 sources of information to make a purchase decision in 2011, up from 5.3 sources a year earlier, according to a study from Google and Shopper Sciences (linked at the bottom of this article). Content marketing fits this trend. Marketers supply blogs, videos and whitepapers to help shoppers and corporate decision makers solve problems and learn how their companies can help. It's not a direct sales strategy. It's a gradual strategy, which makes it harder to measure. But marketers need to measure content marketing. 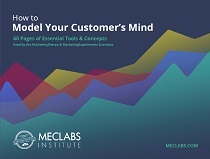 Measurement reveals how your content fits into the customer's buying cycle. It can identify the best formats, topics and strategies to use, and it supports requests for more investment. We interviewed Joe Pulizzi, Founder, Content Marketing Institute, as well as Michael Brenner, Senior Director, Global Integrated Marketing, SAP, on how to effectively measure content marketing. In the tactics below, the experts share different ways to measure and improve content in companies large and small. You've likely heard this before, so we'll keep it short. You cannot measure performance without setting a goal. Otherwise, what would you measure? Your goals dictate which metrics to track. Driving sales - individual pieces of content can increase site traffic, lead volume, conversion rate, etc. Saving money - content can help cut cost-per-lead, customer service costs, etc. Making customers happier - content can help increase retention, customer lifetime value, etc. For many companies, the best way to measure content marketing is to track and combine results of individual projects rather than trying to tackle the entire program, Pulizzi says. "There is an easier way to do it than measuring your whole content strategy. You're really looking for a lot of singles here. Lots of singles add up to runs." The people who create your content need to know what works best. It's the only way they can efficiently improve results. This feedback comes in the form of granular metrics. These metrics can be tracked post-by-post, across a topic, or across the channel (a blog in this case). "All these little things are very important for the content creators because that's how they show they are actually getting traction," Pulizzi says. "These are things that you'd never want a content creator to look at, but something that a manager can look at and make a hypothesis on the direction of the blog," Pulizzi says. SAP is a global, enterprise-level company that provides business management solutions. It staffs thousands of marketers, and almost every one creates content. Combining that with SAP's benchmark reports, social media outlets and other content gives the company a massive and growing library. Brenner is tasked with identifying the content that drives the highest ROI for the company and establishing best practices. Measurement is "extremely important" at this scale, but tracking results piece-by-piece is impractical, he says, especially when much of the content is repurposed. "It's difficult to say that the success of a whitepaper should always be determined by the number of registrations it generates because we'll take that same whitepaper and use part of it in an email, or a blog post, or in an article on our website," he says. Rather than tracking individual pieces of content, SAP created an index it calls "Return on Interesting." The index scores the amount of engagement the company's content generated in a particular category or market. The index (a work-in-progress) was created by a cross-functional team of executives and specialists in operations, IT, analysis and marketing. "Those kinds of metrics are being seen as the driver of our future growth," Brenner says. "We're currently creating a baseline for that, and then we're going to look to see if we're improving that over time." Many companies attribute to the "last touch." If a customer makes a purchase after seeing a television ad, a billboard and a paid search ad, they attribute all the revenue to the paid search ad for tracking purposes. This is a simple but flawed approach. The television ad in this example is not credited for influencing the sale, even though it may have sparked the customer's initial interest. SAP takes a different approach. The team analyzes customers' paths to purchase to see which types of content and interactions were best at attracting, engaging and converting leads. "Each of those different touch points are getting an allocation value based on the closing revenues," Brenner says. "We're looking at any company that becomes a customer, how many touch points they had, and what is the relative value of each of those touch points. … I know exactly what new properties and what content types drove the highest return on investment, and when I say 'return,' I mean revenue." Measuring for the sake of measurement is a waste of time. Companies need to measure content marketing to know where to improve and where to invest. Pulizzi's team looked at sharing activity and other metrics and discovered that the business social network LinkedIn could be an area of opportunity. "LinkedIn has been growing like crazy from a social media sharing standpoint for our content. So we are looking seriously at how to take more advantage of that. … We may have to be more serious about how we share or build relationships there." Customers toward the end of the buying cycle were interested in product-specific content, and the team had plenty of it. Customers in the beginning of the cycle were interested in content on how cloud computing could help solve their challenges. However, the team had very little of this content. In response, Brenner interviewed customers for a series of blog posts that highlighted their challenges and how SAP's products helped. "It generated tremendous amounts of traffic and comments, and it was great exposure for these customers," Brenner says. 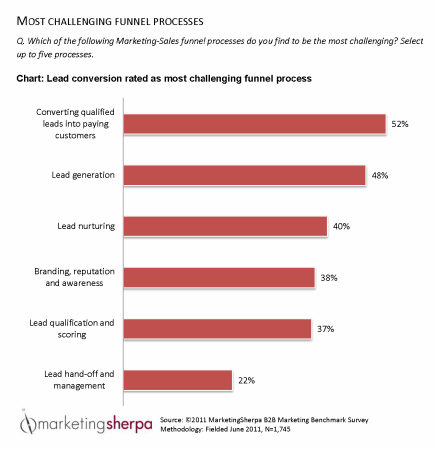 Companies with a complex sales process often use content to attract and nurture leads. If you're hoping to use content to plug holes in your funnel, take a look below to see where other companies have the most trouble. The chart is from the MarketingSherpa 2012 B2B Marketing Benchmark Report, authored by Jen Doyle, Senior Research Manager, MECLABS. "If you're familiar with Google Analytics, or you're familiar with some of the enterprise analytics packages that are out there today, that’s really all you need," Brenner says. That said, if you want to track visitors on a one-to-one basis or understand how content impacts willingness to purchase, you will need to pay. If that scares you, realize that many companies spend thousands of dollars each year on content and that tracking results can reveal how to improve ROI. "We're so infatuated with the creative that we don't take two seconds to look at how this is making an impact on our customers," Pulizzi says. "[Tracking software] is not glamorous. I can't hold or touch or feel it, but you can take that feedback from the technology and then improve the content you have." Having someone in the office who is handy with spreadsheets help you interpret data and point to the best opportunities. One reason SAP is able to learn so much about its customers and content is that it has teams of people dedicated to measurement and analysis. "I don't think [these staff members] need an advanced degree in stats," Brenner says. "It's really about having a team of dedicated analysts." Want more content marketing case studies? Get our free Inbound Marketing newsletter.